Extending from the 2016 Leaf Autographed Mini-Helmet Football release, 2016 Leaf Autographed Full-Size Helmet Football offers, as the name suggests, full-sized replica helmets. Each box contains one signed helmet. 2016 Leaf Autograph Full-Size Helmet Football keeps collectors in suspense, as each individual helmet is issued in a blind-box format. In other words, every box looks and feels the same in order to keep its contents a true mystery. Unlike 2016 Leaf Autographed Football Jersey, which features custom gear without team logos, the full-size replica helmets are officially licensed by the NFL. 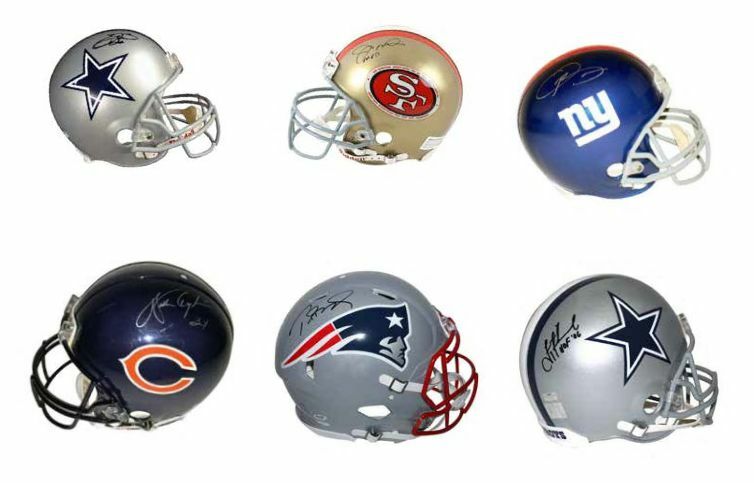 Although a final checklist is not yet available, the sell sheet teased autographs by Hall of Famers, rookies, and active NFL stars, including Emmitt Smith, Jerry Rice, Marcus Mariota, and Tom Brady.